The Absolute BEST Kids Sewing Machine Picks for 2019 | My 10 Favorite! Congratulations, you're thinking of introducing your child to the wonderful world of sewing! Once you've noticed that your child may have an interest in sewing, the next step should be to check out the marketplace, and see what kinds of sewing machines are out there. This guide was written to help you with your research. There are literally thousands of models and kits to buy, but most of them were constructed with adults in mind. If your goal is to give your child a new life-skill, then you want to make sure you get them a machine that is easy to use and of course safe for them. There's no set age for teaching your child to sew. Some kids are old beyond their years and can handle learning to sew when they are just 3 to 4 years old. Whatever age you start them at, this guide will help you to choose the safest and right model for them. Brother XM2701: best overall model, easy to use for kids. Singer 3232: highest number of stitches available. 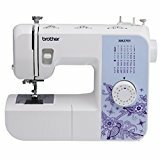 Brother XM1010: great kids instructional sewing machine. Singer 1304: good value from a highly regarded brand. Singer 2259 Tradition: highly recommended for older/more experienced users. My picks are based on a combination of features, price, warranty and overall value. What Features Are Important For A Child? Is My Child Too Young To Sew? Choosing the right sewing machine for a kid is a matter of matching their personality to the different features that beginning machines offer. The features that we will be looking at include speed control, brand names, automatic needle threaders, and large dials. A kids sewing machine must have good speed control. It should be able to adjust to your child's expertise and level. Kids will get frustrated if they feel that they are sewing too fast or they are losing control. It's good for the model to have an automatic stop so it won't continue to operate when it runs into resistance. There are many brands on the market, but it never hurts to buy a model with a name that has a track record of quality. 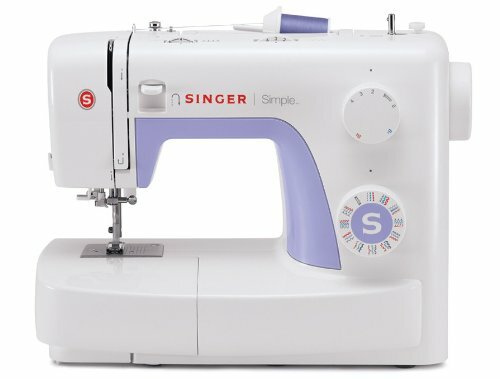 Singer is one of the most recognized names in the industry and has a stellar reputation for well-built, basic machines. Singer machines come with easy to follow diagrams and instructions. 3 models reviewed below include the Singer 3232, the 1304, and the 2259. 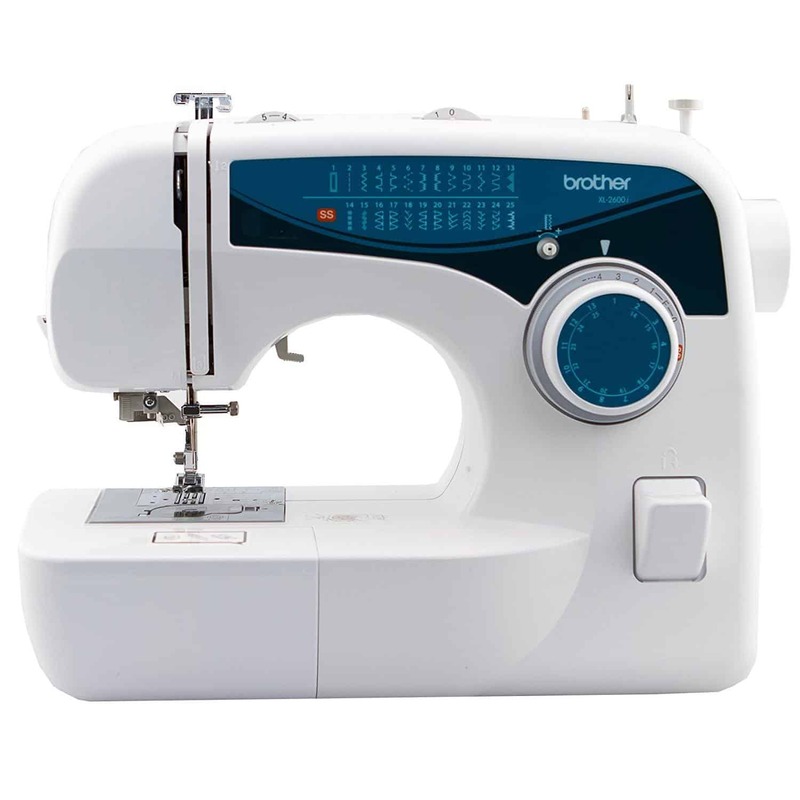 Brother sewing machines are also very highly regarded by parents who want a good quality machine that has excellent stitch quality and can deal with a bit of rough handling. Here we look at the Brother XL26001, the LS21251, th XM1010, and the XM2701. The Janome brand has become increasingly popular for its safety features and multiple options that youth and adults can both appreciate. Popular models are the Janome Fastlane and the Hello Kitty machines. Rounding out our list is the fund and fabulous Michley-Tivax Lil' Sew & Sew. This is a high quality, lightweight, relatively inexpensive machine that is easy to carry around. It works well for basic mending without expensive, unnecessary, extras. Ask any parent that has tried to thread a sewing machine with their son or daughter and they will tell you what a headache it is. Children will be able to immediately get right into their sewing project without extra muss and fuss. Kids will definitely appreciate a model that has a large stitch selection dial, preferably located front and center for easy access. Big tension dials and easy to reach reverse levers also get high marks from children beginning to sew. No matter how vigilant a parent or guardian is, there are always those times when an accident occurs. That's why it's so important to pick the correct model from the beginning. A child should never start sewing on an industrial machine made for adults. Beginning sewers will naturally make many mistakes, but we don't want those mistakes to lead to a serious injury. They will put a bobbin in wrong, break needles, jam threads, etc. For these reasons and more, you should start your child's journey into sewing on a lightweight machine that's been constructed with kids' safety in mind. Portability is also important. Carrying a lightweight machine into the kitchen to sew with mom or dad is much easier than trying to lug around a heavy one. If your machine has a foot pedal, don't operate it barefoot or with slippers. There are a number of sewing machines on the market designed especially for children and beginner sewers. We would recommend that you don't buy a "toy" model sewing machine. They jam easily and may cause your child to get frustrated and give up sewing. Look for a real sewing machine that is designed for novice sewers and available at a reasonable price. Safety is the number one feature to look for, of course, but there are other considerations and machines to consider, depending on the age, interest, and skill level of your child. Children 7 and above are at the perfect age to learn on a mechanical sewing machine. There are many models out there that are easy to thread, the bobbin winding is uncomplicated, and stitch selection is a simple. It's important to choose a model that complement's a child's personality. If they get bored easily, you may want to consider a machine that has a lot of features and options. The Brother LS2125i is a great kids' sewing machine with many options. It's lightweight, budget-priced, and easy to set up. Ten stitches can be selected by turning a dial, including an automatic four-step buttonhole stitch. It offers the variety that children love - it's a top-loader and even winds the bobbins for you! It has a variable-speed pedal control that helps your child to keep up with needle speed. Another recommended option is the Brother XL26001. It has a switch selection dial, a simple free arm for hem sewing, and a drop-in automatic winding bobbin. It also has 25 unique stitch types that will be ready and waiting once your child has mastered zigzag stitches and a basic straight line. Children as young as 3 or 4 can be started on a small, lightweight machine that can do standard sewing. Start them off by practicing sewing using no needle, so that they'll get used to the machine. Once you're confident that they know how to keep their fingers out of harm's way, you can put the needle in and have them sew with slowly adult supervision. Some children may do well with a sewing kit designed especially for them. You can buy a complete set, that includes kids patterns, machine and accessories. We generally don't like these kits though because the machines aren't usually all that well made. A first sewing machine should be lighter than a general purpose machine, have child-friendly safety features, and be less expensive than larger adult models. Studies confirm that boys and girls who start sewing at a younger age are capable of understanding necessary safety measures, can learn early how to protect small fingers from a presser foot, and in general will have a higher level of safety knowledge than children that start at a later age. Online reviewers speak very positively about the Janome Hello Kitty Sewing Machine for the youngest children. This machine offers a free arm, 11 stitches, a four-step buttonhole, and a convenient carrying handle. There's nothing fancy here, but there's enough functionality so that children can learn basic skills on an inexpensive, reliable machine. The extra high presser foot snaps on and is sturdy. In fact, the three feet that are included are as secure and stable as any screw-on feet. The tension dial and reverse lever are also easy to reach. Why It's Great For Kids: Young sewers will appreciate its light weight, many sewing options, and built-in needle threader. 25-year limited warranty, and includes free technical online and phone support during the entire life of this product! This inexpensive sewing machine is a dream for young sewers. 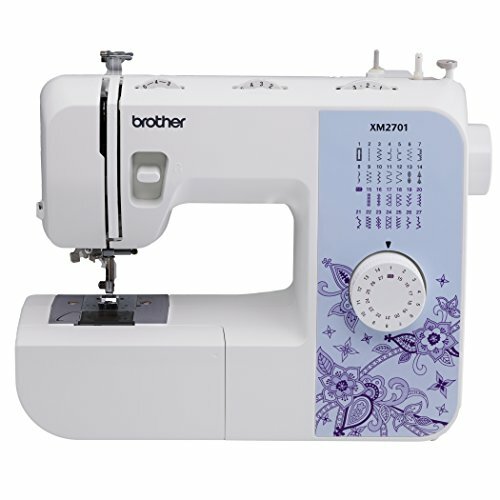 With a rating of 5 stars, the Brother XM2701 is lightweight (7.2 pounds), has a one-step auto-size buttonhole, an instructional DVD, and 6 fast-change sewing feet (zipper, buttonhole, zigzag, blind stitch, narrow hemmer, and button). In addition, this machine has a needle threader that's built in, a top drop-in bobbin that's jam resistant, an entirely automatic bobbin-winding system, and a bright LED work area. The XM2701 has a complete range of easy-to-use features that will please little fingers. Its built-in free arm is specially made to simplify sewing cuffs, pant legs, and sleeves. Just turn the dial to select a stitch, and touch a lever on the machine's side to automatically thread the needle. 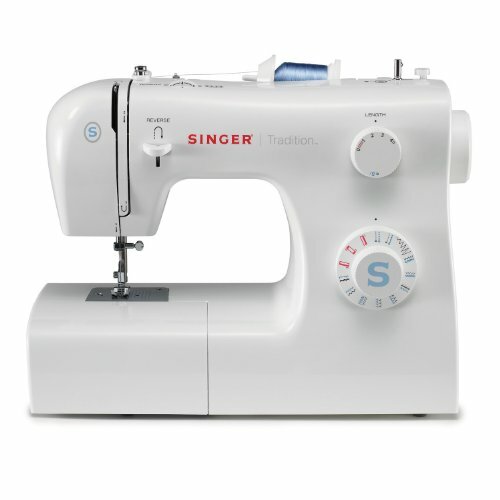 The Singer 3232 Simple Sewing Machine has a 4.8-star rating and is reasonably priced and simple to use. It features 32 built-in stitches (6 stretch stitches for mending and construction, 6 essential stretch stitches that move along with the fabric used, an automatic, 1-step buttonhole maker, and 19 decorative stitches), a time saving automatic needle threader, and an adjustable stitch width and length, which prevents fabric from bunching and keeps all seams strong. Its completely automatic one-step buttonhole gives professional results with one button touch. This Singer product has online support, including social media support for connection to other sewers for tricks and tips of the trade. A number of online tutorials are available on threading, bobbin installation, and training on presser feet. The Brother XM1010 is an inexpensive and useful machine. It is a lightweight, full-size, portable machine that is specifically designed for everyday mending and sewing. It's ten different, built-in stitches include stretch, zigzag, blind hem, and an auto-size, 4-step buttonholer. Four sewing feet are included - zipper, zigzag, zipper, and buttonhole. It also includes these easy to use features: drop-in, jam-resistant top bobbin, automatic bobbin winder, reverse sewing, easy stitch selector dial, thread tension control, and bright LED lighting. The Singer 1304 allows the sewer to change the stitch in one simple step. This very reasonably priced machine. It has six built-in stitches - zigzag, satin, straight, scallop, blind hem, and buttonhole. It has a four-step automatic buttonholer and dual spool-pins that provide twin needle sewing in parallel rows. It also features free accessories (three snap-on presser feet - zipper foot, all-purpose foot, and buttonhole foot), a heavy-duty metal frame, and an automatic bobbin-winding system. A removable free-arm allows easy access to collars, pant hems, cuffs, and other hard-to-reach areas. The Singer 2259 saves time with its easy, quick threading feature. Kids enjoy the adjustable zigzag width and stitch length. This machine features 19 built-in stitches with a fully automatic four-step buttonhole, four snap-on presser-feet, and easy stitch selection. It is reasonably priced and has a free arm and on-board storage, as well as a simple stitch selection dial. Nineteen built-in stitches offer many options for decorative sewing, home decor, crafts, and fashion sewing. 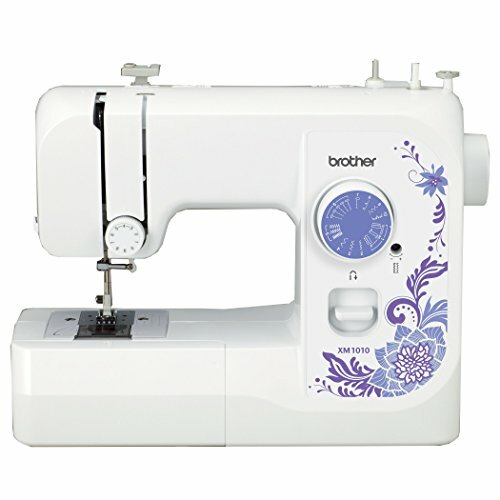 The Brother XL26001 features a thread cutter, needle threader, auto bobbin winding, drop-in bobbin loading and a one-step auto-size buttonholer. It also has 25 built-in stitches (including decorative, utility, and heirloom stitches), each one capable of multiple stitch functions, and a free arm that permits fast and simple sewing of shirt sleeves or hems on pants. This very versatile machine is ideal for kids creating or altering clothing, quilting, crafting, home decor, and so much more. This is a fantastic product for a very affordable price. The Janome Fastlane, is one of the finest, most reasonably priced children's sewing machines on the market today. This portable machine is the right choice for sewing and alterations on the go. It's ten built-in stitches include zigzag, crescent (for custom hems), and straight with 2 needle positions, accessory storage, a free arm, easy reverse, a top drop-in bobbin featuring a transparent cover, and threading diagrams. Its multiple sewing functions include paper crafting, scrapbooking, mending, general crafting, creating doll clothing, applique, seaming, quilt piecing, and zipper insertion. This product comes with a 25-year limited warranty. The Janome 11706 features a free-arm, carry handle, 4-step buttonholer, and eleven stitches (including two stretch stitches). This lightweight kids machine (12 pounds) is portable and is an excellent choice for taking to sewing class or dorm rooms. 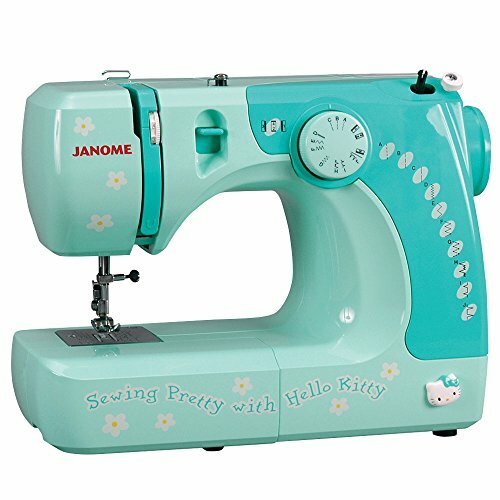 The Janome Hello Kitty also has a three-piece feed dog, an extra-high presser-foot lift, a push-pull bobbin winder, snap-on presser feet, stitch selection dial, and a vertical oscillating hook bobbin. This sewing machine is well made, has an easy-to-follow manual, and creates nice, even stitching. 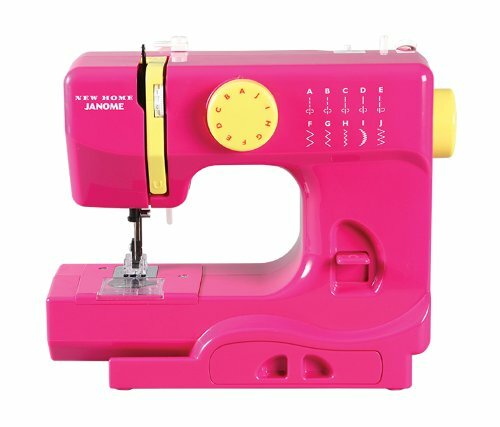 The Michley-Tivax Lil' Sew and Sew LSS-505 provides eight built-in stitch patterns, double thread, and double speed, forward and reverse sewing, and two speeds for easy use. It sews sleeves, features a built-in sewing light, and includes an adaptor, drawer, thread cutter, thread bag, and foot pedal. This machine uses DC 6Volt power and comes with a one-year limited warranty. The Lil' Sew & Sew is one of the least expensive children's machines on the market today and has a reputation for efficiency and ease of use. Its light weight (5 pounds) allows sewers to carry it anywhere, and its built-in LED light does an excellent job of illuminating the entire work surface. 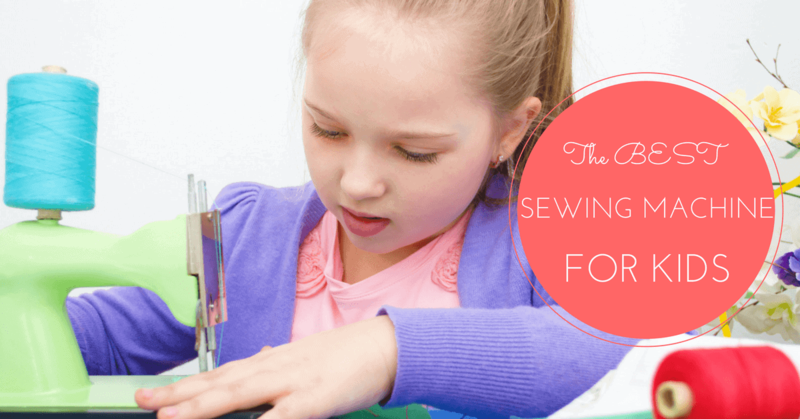 After looking at and comparing hundreds of sewing machines, and reading what seemed like thousands of reviews, we came up with a list of what we consider the top 10 best sewing machine for kids. We considered simplicity, safety features, variety of options, and cost. The top machine for children, in our opinion, is the Brother XM2701 full-featured, lightweight model, which earned a "stellar" five-star rating. Its broad range of simple to use features will please even the most finicky new sewer. This machine's 25-year limited warranty shows just how much Brother stands behind their product. Two machines are tied for second place with a rating of 4.8 stars - the Singer 3232 and the Brother XM1010. Both are simple to use and reasonably priced. The Singer 3232 has 32 built-in stitches (19 of which are decorative), in addition to an automatic needle threader, one-step automatic buttonhole, and an adjustable length and width stitch. The Brother XM1010 shines with bright lighting and has an easy-stitch selector dial, plus an automatic bobbin winder. Thank you for checking out our list of what we consider to be the best sewing machines for kids on the market today. Good luck, and happy sewing! The one machine that 2 of my sewing students own is the Singer 1304. This machine is not a good one for kids because it only has one speed and a machine that can adjust the speed it so much better for beginner sewers. The other problem with this machine is it’s always getting jammed! I would not recommend it at all. Hi Joy – thank you for your comment. Actually, I have always had good luck with the 1304 for kids and beginners….but I also understand where you are coming from and will ask some of my friends for their opinions as well. Thanks! I introduced my grandchildren to sewing using my machine with sliding speed regulator, needle down and start button. They, 5 and 7 years of age, very quickly picked up how to lift the presser foot, put fabric under, lower the presser foot and sew. I set the sewing speed very low. The 5 year old girl liked the stop/start button without the foot pedal, whilst the 7 year old boy could reach the pedal and preferred using it. I started them off without thread and using heavy weight interfacing until they got the gist of what to do. I showed them how to thread the machine and needle and how to put in the bobbin. I think children are more likely to enjoy sewing when the machine works well. The frustration when a machine jams or won’t work properly will put them off. So, I believe letting them use my adult machine under my supervision. They even took to free motion thread drawing like ducks to water when I showed them how to move the fabric/interfacing by themselves under the needle and using the darning foot. They wrote their names and drew pictures in thread. I was amazed at how they followed the steps I showed them, in correct order. They think sewing is very ‘cool’! !